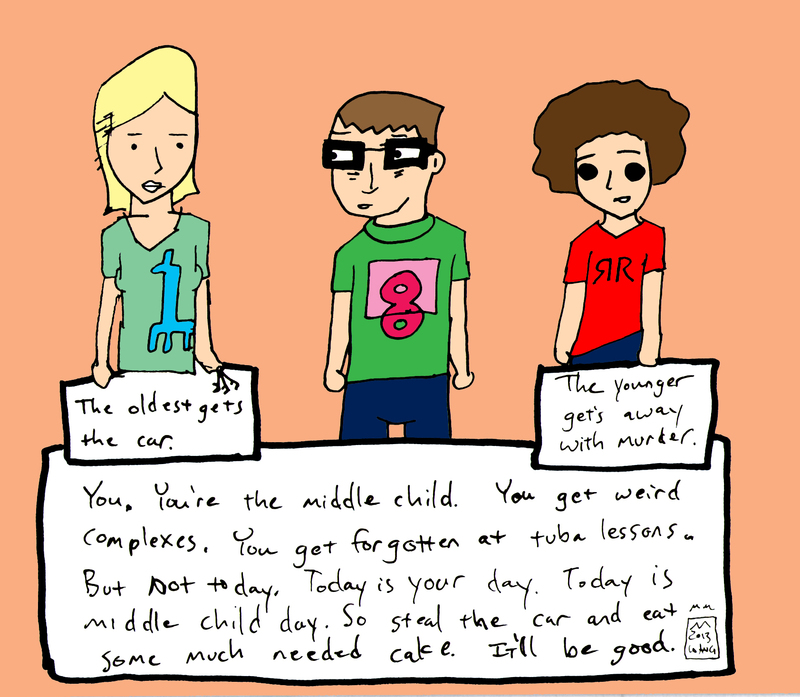 Recently, some were celebrating Middle Child Day. I am waiting to celebrate “The Youngest Child” day. Birth order matters. First a joke for middle children. Thank you minidovecomics.wordpress.com for this cartoon. Of course, stealing the car can get you in trouble, but often is what middle children think they need to do to get attention. Explains some bad behavior of good kids. Parenting tip one: Visit some of the links to learn what the experts think about middle children. If you are a middle child does the information ring a bell with you? If you are not a middle child, but the parent of one, does the information ring a bell with you? Parenting tip two: Remember, all research and all advice applies only to some people some of the time. That means you have to tailor both and experiment to find our what works for you and your child. Parenting tip three: Seek out the good parts of being a middle child and emphasize that. Parenting tip four: Know what is bad about sbout being a middle child; acknowledge and sympathize with that. Parenting tip five: Give each child time alone with you and that child’ other parent. Strengthens both your love and emotional fitness. Parenting tip six: Read the links. DAILY PROMPT Just a Dream You’re having a nightmare, and have to choose between three doors. Pick one, and tell us about what you find on the other side. Obviously, today I picked the middle door. Thinking more about parenthood, there are many nightmares, but mostly just that bad times that come and go like bad dreams, so stay strong. How? Wait the bad times out, enjoy the good ones, laugh and play as much as you can with all your children.